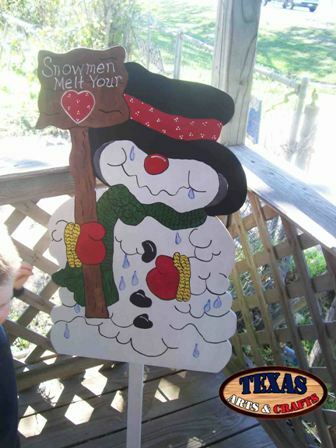 One of the snowman crafts is the Snowman Welcome sign. The yard sign is built in our workshop. The snowman is hand painted white. The snowman has a red scarf and a black and yellow hat. 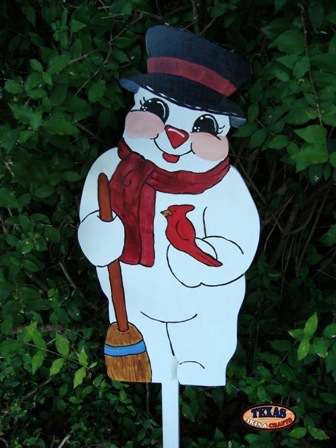 The snowman is holding a blue bird in its left hand and a brown broom that says Welcome in its right hand. The dimensions are approximately 26 inches tall by 21 inches wide by 2 inches deep. The sign weighs approximately 4.25 pounds with packaging. For the continental U.S. shipping and handling is included in the listed price. For shipping outside the continental U.S. please contact us through our Contact Us page. The Snowman Melt Your Heart is another one of our snowman crafts. The yard sign is made in our workshop. The snowman is hand painted white. The snowman has a black and red hat with a green scarf. The snowman is holding a brown Snowmen Melt Your Heart sign. The dimensions are approximately 31 inches tall by 19.50 inches wide by 2 inches deep. The sign weighs approximately 5.50 pounds with packaging. For the continental U.S. shipping and handling is included in the listed price. For shipping outside the continental U.S. please contact us through our Contact Us page. Another snowman craft is the Snowman With Penguins. The yard sign is made in our workshop. 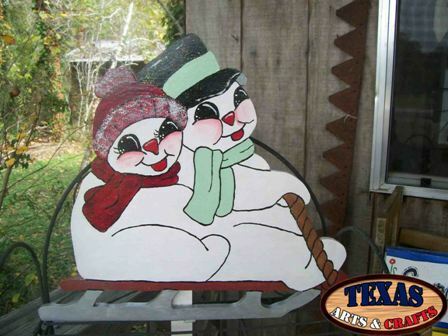 The snowman is hand painted white with a red garment, green scarf, and a black and brown hat. The penguins are painted black and white. The dimensions are approximately 27 inches tall by 12 inches wide by 9.50 inches deep. The sign weighs approximately 5.50 pounds with packaging. For the continental U.S. shipping and handling is included in the listed price. For shipping outside the continental U.S. please contact us through our Contact Us page. One snowman craft we make is the Snowman Skier. The yard sign is made in our workshop. 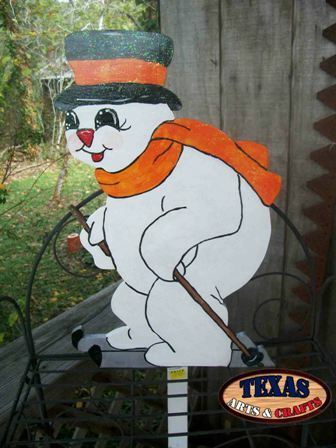 The skier is hand painted white with an orange scarf and a black and orange hat. The dimensions are approximately 23 inches tall by 14 inches wide by 2 inches deep. The sign weighs approximately 3.25 pounds with packaging. For the continental U.S. shipping and handling is included in the listed price. For shipping outside the continental U.S. please contact us through our Contact Us page. The Snowman Couple is made in our workshop. The couple are hand painted white. The male snowman has a black and green hat and a green scarf. The female snowman has a red hat with a red scarf. The dimensions are approximately 17.25 inches tall by 19.50 inches wide by 2 inches deep. The sign weighs approximately 3.25 pounds with packaging. Shipping and handling is included in the listed price. For the continental U.S. shipping and handling is included in the listed price. For shipping outside the continental U.S. please contact us through our Contact Us page. The Snowman Sliding is made in our workshop. 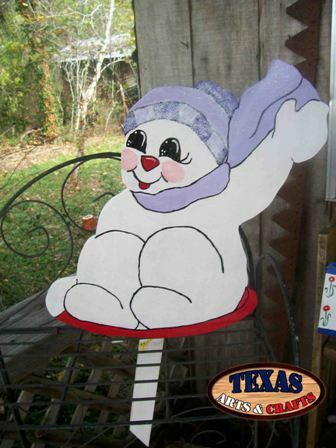 The snowman is hand painted white with a purple scarf and a purple hat. The dimensions are approximately 18.50 inches tall by 13.50 inches wide by 2 inches deep. The sign weighs approximately 3.25 pounds with packaging. For the continental U.S. shipping and handling is included in the listed price. For shipping outside the continental U.S. please contact us through our Contact Us page. The Snowman With Cardinal is made in our workshop. 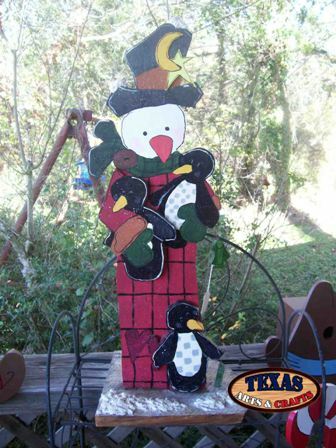 The snowman is hand painted white with a red scarf, a black and red hat, and a straw colored broom. The dimensions are approximately 22.50 inches tall by 10.50 inches wide by 2 inches deep. The snowman sign has a 20 inch stake. The sign weighs approximately 5 pounds with packaging. For the continental U.S. shipping and handling is included in the listed price. For shipping outside the continental U.S. please contact us through our Contact Us page. The Five Snowmen set is made in our workshop. 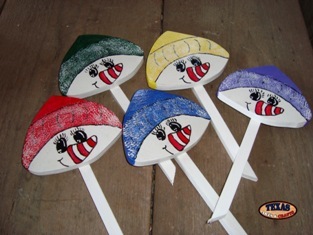 The snowmen are hand painted white with different color hats (red, yellow, blue,green, and purple). The dimensions are approximately 4.50 inches tall by 5.50 inches wide by 2 inches deep. The snowmen signs have 8.50 inch stake. The signs weigh approximately 5 pounds with packaging. For the continental U.S. shipping and handling is included in the listed price. For shipping outside the continental U.S. please contact us through our Contact Us page.